On Friday morning, Vladimir Kozlov, the editor of the Mari newspaper Kudo+Kodu and Chairman of the Mari Council, was assaulted in Yoshkar-Ola, the capital of the Republic of Mari El in the Russian Federation. "This morning, three men assaulted Vladimir Kozlov in front of the Press House of Yoshkar-Ola using an object resembling a chandelier," reports Yelena Rogacheva, a Mari journalist subjected to a similar assault in January. Vladimir Kozlov later phoned from the city hospital of Yoshkar-Ola to Rogacheva, reporting that the assault occurred about a hundred meters away from the Press House when he was going to work. Kozlov was assaulted from behind. The victim was repeatedly struck in the head with a metal object. Struck to the ground, Kozlov was beaten with feet. The assaulters numbered three, but as the journalist was assaulted unexpectedly, he is unable to recall any features of them. (The case of Ms Rogacheva was quite similar.) Mr Kozlov was able to reach the Press House, where an ambulance and the police with a dog arrived. Yelena Rogacheva writes: "Kozlov is currently in the hospital, the loss of blood is immense due to the wounds. Vladimir Kozlov could not assess his state, noting only the loss of blood." The assault is probably connected to the Mr Kozlov's political activities. As Chairman of the Mari Council, he has thrice initiated protests against the non-democratic presidential elections of December 19, 2004. The participants in the demonstrations protested against violations which took place all through the election period until the day of the elections. Lack of confidence in the candidate to be re-elected, Leonid Markelov, was also shown during the demonstrations. As a Mari student studying in Estonia recently reported, the cell phone number of Vladimir Kozlov is blocked as well as his e-mail address. 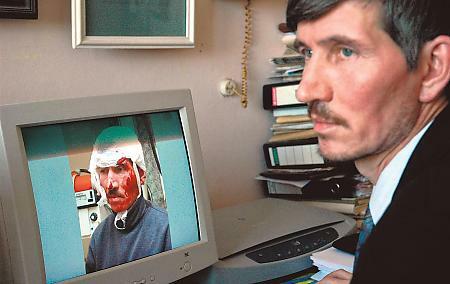 Vladimir Kozlov (also known by his pen name, Laid Shemyer) is a Mari activist and writer as well as a journalist. Last year he was elected Chairman of the Mari Council and the Mari representative in the international Consultative Committee of Finno-Ugric Peoples. Mr Kozlov has also been awarded the Order of the Cross of Terra Mariana by Lennart Meri, the President of Estonia for advancing Estonian-Mari cultural relations in the field of literature. Under the pen name Laid Shemyer, Mr Kozlov has translated the works several Estonian writers into the Mari language. During the last few years, Mr Kozlov has taken the lead of the Mari ethnic opposition against President Leonid Markelov of the Republic of Mari El.